Milanese is traditionally made with veal or chicken, but we put a lighter, meat-free twist on it and used eggplant. You can serve this over a bed of noodles or simply increase the amount of greens and vinaigrette. Serves 2 to 4. Directions: Salt and pepper both sides of the sliced eggplant and allow the slices to sit while you prepare the other ingredients, or for at least 10 minutes. In a small bowl, whisk together 1 tablespoon olive oil, the balsamic, dijon and salt and pepper, to taste; set aside. Place the spinach and tomatoes in a medium bowl; set aside. Add flour to one shallow bowl or rimmed plate. In another, lightly whisk the egg whites. In a third bowl or plate, mix together the bread crumbs and spices. Add 1 1/2 tablespoons oil to a large skillet over medium heat. Dip each side of each eggplant slice in the flour, then in the egg and finally in the bread crumbs, shaking off excess in between. Working in 2 batches (add 1 1/2 more Tbsp oil in between batches), cook the eggplant until golden-brown and crisp, about 3 to 4 minutes per side. Transfer to a serving platter and set aside. Drizzle about half of the vinaigrette on the spinach and tomatoes; toss to incorporate. Add more vinaigrette if desired, but be careful not to over dress. Top the plated milanese with the dressed spinach, top with shaved Parmigiano-Reggiano, if desired, and serve. 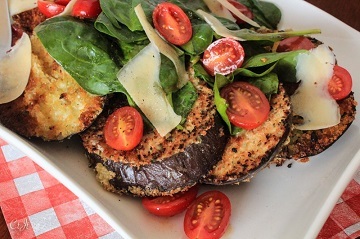 Grilled eggplant is great on a veggie platter or then used in a variety of dishes, including lasagna. Directions: Slice eggplant in 1/4 inch slices. Brush each side of the eggplant with a light coating of olive oil. Sprinkle on a bit of salt and pepper on each side. Grill for about 5 minutes on each side or until tender. I think this dish is even better reheated the second day as all the flavors will have melded together! This is for a 9×13 size baking dish. Serves 6+. Directions: Preheat oven to 400 degrees F. Slice eggplant lengthwise, brush it lightly with olive oil and dust with salt and pepper. Place in baking tray to roast for 20 minutes. Remove and reduce oven to 350 degrees F.
Brush olive oil on the bottom and sides of a 9×13 baking dish. Spread a couple tablespoons of the marinara on the bottom of the dish and then add on a layer of cooked noodles. Dollop a bit of ricotta on top of the noodles and then add slices of roasted eggplant, laying them out in a single layer, as you would lasagna noodles. Next, sprinkle on a layer of shredded mozzarella and follow that by a layer of Sigona’s marinara sauce. Repeat the layers until ingredients run out. Finish with a sprinkling of the remaining ½ cup of mozzarella. Bake for 1 hour and allow to rest at least 10 minutes before serving. A traditional Sicilian caponata always features eggplant. Other typical ingredients include raisins, garlic, tuna, red wine vinegar, balsamic, anchovies, olives, flat leaf parsley, olive oil, bell peppers and pine nuts. Simply typing this makes me want to go home and whip up a batch of Sicilian caponata this very second. You can use a variation of any ingredients, adding or removing any of the above or following: onions, zucchini, tomato paste or bouillon, lemon juice or red wine vinegar. Just eyeball amounts based on what you know your taste buds like! The process is simple: While the eggplant is grilling or under the broiler, dice up all vegetables and herbs, drain the tuna and anchovies (if using) and gather up all other ingredients. In a large sauté pan, start with a little olive oil and sauté the onion. After it’s a little soft, add the garlic, peppers, zucchini, nuts and raisins. Add in the vinegars or lemon juice and a bit of tomato paste or bouillon. Stir and then add in the diced, grilled/broiled eggplant and cook until the liquid is absorbed and vegetables are starting to become tender (about 15 minutes). The eggplant will absorb the flavors of all the other vegetables and seasoning because it acts like a sponge. Remove from heat and stir in any remaining additions, such as parsley, anchovies, tuna and olives. Season with salt and pepper. This dish tastes much better if refrigerated for a day as the flavors get a chance to meld together. We normally eat this as an antipasta, but it also goes great over pasta, whole grains, such as Farro, Integral brown rice, polenta or crostinis. By Luisa Ormonde of Luisa’s Catering. Moussaka is a comfort dish which originated in Greece. It’s made by layering eggplant with a spiced meat filling which is topped with a creamy béchamel sauce before it’s baked to a golden brown. A special thanks goes out to Luisa Ormonde, a local personal chef and caterer, for sharing this recipe! Preheat oven to 400 degrees. Slice eggplant into 1/2-inch thick rounds. Mix a little olive oil with melted butter and brush each side. Season both sides with kosher salt and pepper. Place on parchment paper lined baking sheet and bake until softened & golden brown. Set aside. In a large skillet, sauté onions in 1/4 cup butter until tender. Add garlic. Crumble beef into pan and brown. Add the purees, wine, salt, pepper, parsley, cinnamon and sugar; mix well. Simmer uncovered for 30 minutes or until juice is absorbed and cook covered for an additional 30 minutes. Remove from heat. Stir in 3 tablespoons bread crumbs to the meat sauce and 1/2 cup of the cheese. Sprinkle remaining bread crumbs on bottom of 17 x 11-inch baking pan. Place a layer of eggplant slices on the bottom; then layer of meat mixture. Repeat layers ending with eggplant. Pour cream sauce over all. Sprinkle with remaining cheese. Bake at 350 degrees for 50 minutes or until golden brown. Remove from oven; cool 15 minutes. Cut into squares.